The only thing I get more excited about than doing art therapy is talking about art therapy. 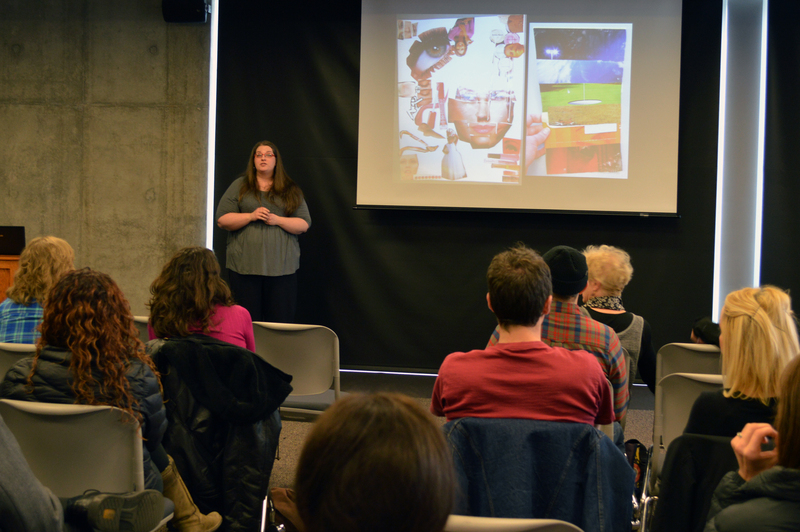 So, you can imagine how pleased I was to be invited to give a presentation about the power and practice of art therapy at the University of Utah School of Social Work’s lunchtime lecture series. The administration had mercifully worked on lowering my expectations for this event. After all, the presentation was to be held during a busy lunch hour between classes and in a far corner of the building. What they didn’t understand is I’ll take almost any opportunity to talk about art therapy, even if just to 5 or 10 harried and hungry graduate students. What a surprise and a thrill it was to meet with nearly 50 graduate and undergraduate students (from a variety of schools within the university), professors, community members, and potential students. It was humbling to say the least! They had great questions about art therapy, and I was so grateful for their attention and enthusiasm. Plus, I got to use one of my favorite slides of all time. Don’t worry if this slide seems flippant or dismissive. There are lots and lots and lots of things that work in this world, even if we don’t know exactly why. This even applies to things like medications, forgiveness, and science-y stuff. Regardless of how much we think we know, there is still a good dose of mystery in the world, and no shortage of it in art therapy. But, once you’ve seen something work over and over again, it’s easy to forget about the whys and hows. 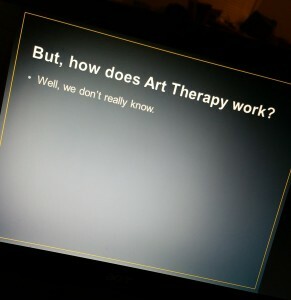 But, I know that a small army of art therapy researchers are trying to find those answers. For now, I just keep my head down and do work that works. One of the things that was most humbling about this presentation was that there were a number of my current and former coworkers who showed up to hear what I had to say about art therapy. These are people who have worked closely with me, seen my work, participated in my groups along with clients, and know the power of art therapy first-hand. After all that, they were still willing to give up a lunch hour to hear what I had to say. What an honor!